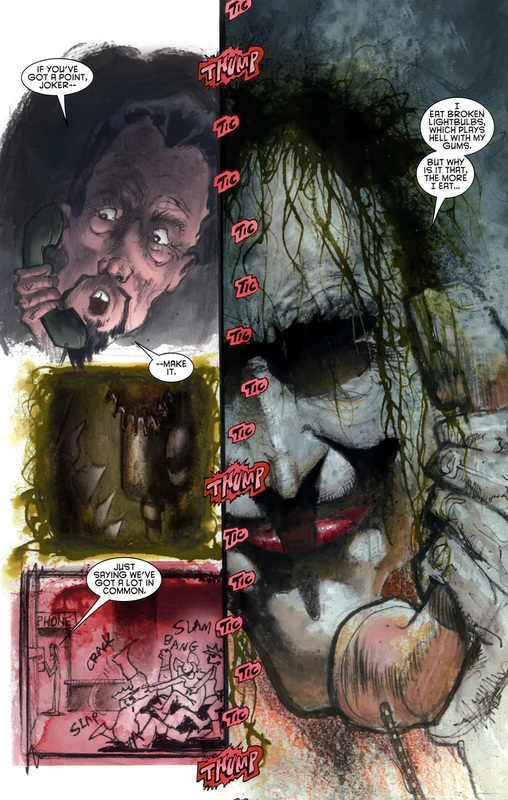 Scans come from Arkham Asylum: Madness by Sam Kieth. 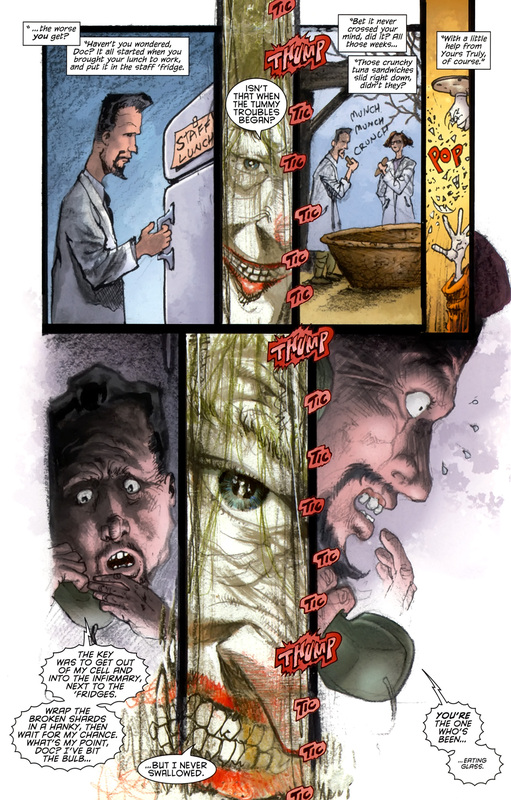 More proof that Arkham Asylums guards fail at their jobs! I'm assuming that they didn't even bother tying Joker down because otherwise there isn't any way that he could have opened the door (it's clearly shown to be shut) to put the glass in it. I can't tell if this is just the Jokergod using his Jokermagic to make people mindlessly go around getting themselves murdered by him or if the people of Gotham actually consciously know that the purpose of their existence is for them to get murdered by the Joker and set about facilitating this wherever possible. Do they have stage direction beforehand, like "Okay guys they're going to be wheeling the Joker in here in a couple of minutes, they've made sure not to restrain him in any way so when they bring him in everyone make sure those straps stay loose and unfastened, Tony your lunch IS clearly and personally labeled right? and remember everybody we have to keep our backs turned and pretend we can't hear someone a couple of feet away for at least as long as it takes him to fish the glass out of his gums and, Tony, I realize we're asking a lot of you on this one but just do the best you can to pretend your glass-filled food isn't also visibly covered in blood and spit, ALL RIGHT EVERYBODY, QUIET ON THE SET"
"That was good, guys. They're gonna wheel him back to his cell and replace the bulb with the same one he's smashed and chewed the last four times we did this. All right, it's a wrap. We'll do this whole thing again tomorrow! Eighteen more times and we're good to go, boys!" God!Joker is my least favorite character ever. He's like Wolverine in the Wolverine and the X-men cartoon, where all the other characters become dumber and severely incompetent whenever he's around. It isn't fun to read about. He doesn't come off looking good. Everyone just ends up looking stupid. You know, if they actually made it so he had a subliminal psychic "super incompetence field" around him, that would actually be an interesting ability. Or like poorly written Bat-God... which is kind of fitting. If their competence dimming powers were to ever peak at the exact same time it would reduce Gotham into the New New York from the Futurama episode with the Big Bad Brains! Why does Arkham Asylum have their refrigerators right next to patient beds in the infirmary? Besides the obvious stupidity of it, that can't be sanitary. Also, how on Earth does somebody eat glass on a daily basis and not notice it? I would think that would be pretty easy to diagnose. DC seems intent on turning the Joker into their own personal Hannibal Lecter, except they can't seem to think of any way to get him to kill somebody that highlights his own mad genius instead of everybody else's abject stupidity. This sort of thing doesn't impress or interest me, as it would require the Joker being left, unattended and unrestrained in a position to open infirmary refrigerators and contaminate the food, REPEATEDLY... over WEEKS. It's not even clever, it's just... dumb. 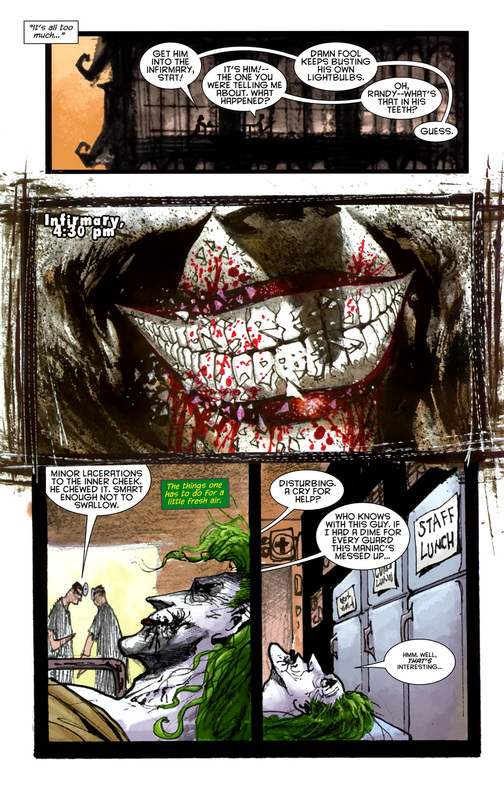 Even restrained, putting Joker ANYWHERE near something that'll be ingested is... dumb. Every individual part of this entire setup is dumb. 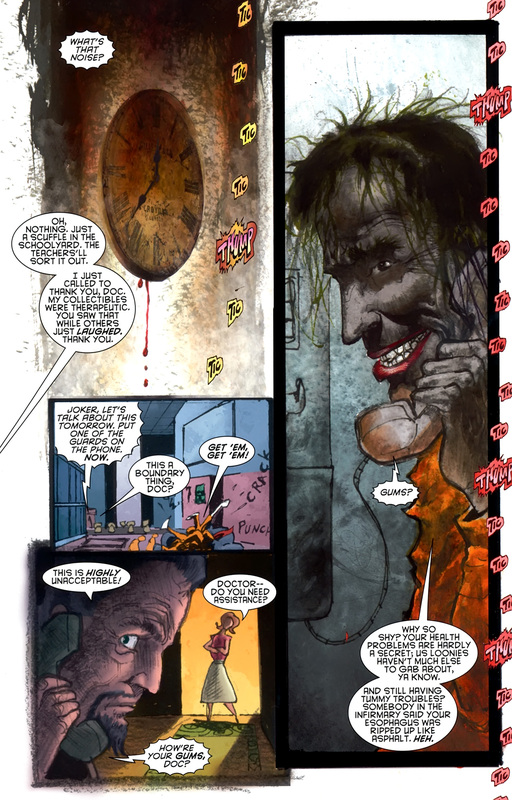 The complete picture is like... MAYBE less dumb than just putting a gun in the Joker's hand and putting the barrel in your mouth and going GOSH, I SURE HOPE NOBODY PULLS THE TRIGGER OF THIS GUN THAT I HAVE STUCK IN MY MOUTH, THAT WOULD TOTES RUIN MY DAY. ..... That.... is a perfect metaphor where I couldn't think of one, thank you. Yes, this. Once, I could see happening. Distraction called the guards away, loose strap that hadn't been repaired, left him in the hall next to the staff breakroom (I am just *not* buying that the infirmary is next to the staff fridge), whatever. Poison someone's lunch? Sure. Several times, consistently? Nope. Oh, and the doctor never noticed the crunchy bits in the tuna salad? 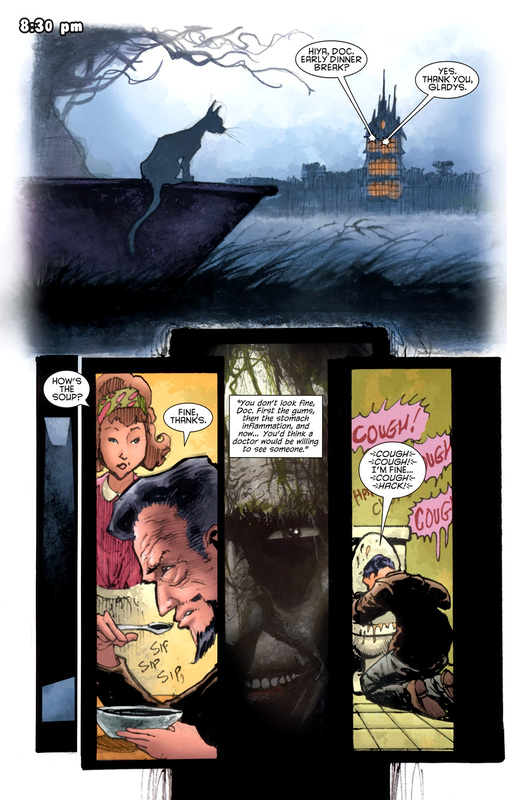 And what, Arkham doesn't have cage-around-the-lightbulb technology? Or ceilings too high to reach by jumping? You'd think that after the first one or two (or eight or ten) broken bulbs, they'd do something to remove his access. Did the staff think it was funny that he was chewing light bulbs and decide to see how long he'd keep it up? It's like there's a rule that says "every time there's a story about the Joker in Arkham, the staff must all pretend he's never been here before and have no idea that his 'crazy' stunts might be really dangerous. Also, they must ignore all standard real-world safety techniques." This is why I liked The Silence of the Lambs (even if it did eventually bring out the idiot ball for the guards in the Memphis jail to carry so that Lecter could escape): they didn't let the world's most dangerous psychopath lie unrestrained and turned their backs on him where he could do something to harm others. So recently, my friend and I finally finished season one of Kaiji (well, I finished it for the second time, but I figure I could rewatch season one before starting two with him). Once it hit E-Card, we were discussing Hyoudou and for the most part, his laughter, intensity and... Well, pure genius on top of his love and insatiable desire for all extremely demented forms of luxurious torture. 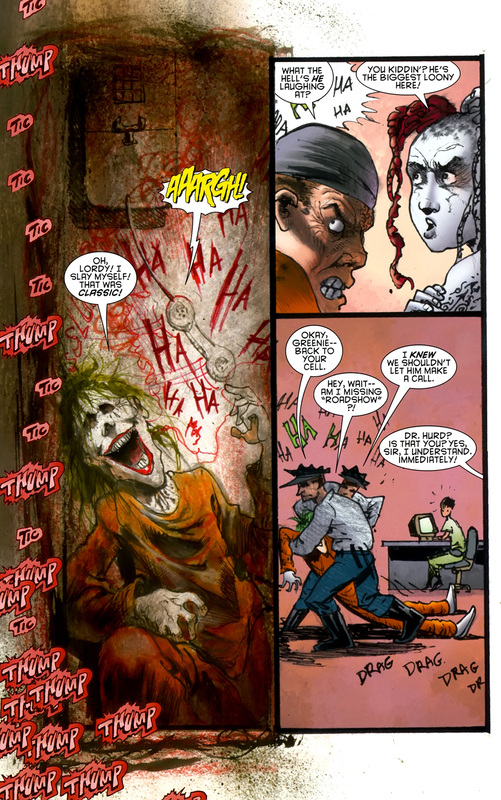 At one point, since he even calls what they're doing insane, and for all his laughter, I came upon the realization that he's scarier than the Joker. The best part is, unlike God!Joker, he just isn't given these randomly god-like abilities. And there's lots of genius surrounding him. Worse yet, the brutality he shows... Doesn't make me hate him. I kind of wanted to make a post titled "The man that's scarier than the Joker," but when you're being written like this, it's probably not hard for lots of characters to be scarier than you. Fukumoto is really great at creating villains that are clever and insane in equally understandable ways. Pretty much anyone Kaiji faces for more than just a few minutes gets fleshed out really well. I mean, Tonegawa does incredibly bad things but you can still understand and even admire the guy. I think Washizu from Akagi is just as fascinating as Hyoudou. Just one of the reasonsFukumoto is one of my favorite writers. Seriously. I really love that about his works. And definitely agreed with Tonegawa. It was hard to actually dislike him early on, and by the end of things, I could only deeply respect him. Washizu is pretty fascinating! He's one of the reasons I've become very intent about restarting and getting further in the manga. Exactly~. He's one of my inspirations and someone who has a top spot among my favorite writers. FKMTKrazy has translated a short Akagi arc that was cut from the anime that serves to show more of Akagi's human side (and wrap up things with Osamu) and has started translating the Washizu match beyond where the anime left off. So now is a great time to jump in. It's great to be getting more Akagi content in english. And apparently Madhouse is interested in making a season 2 of the anime. Oh, awesome! That is enough to make me go hunt that down now~.